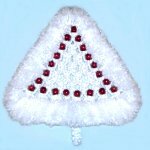 Description: The Winter Tree is a special holiday decoration the whole family can enjoy, and is a great project for children and beginners. 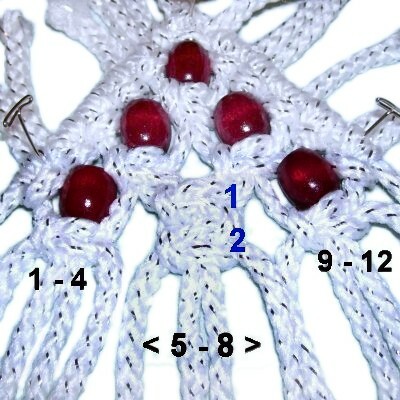 The pattern requires you to know only basic knots, so it's easy to make. The most time consuming part is the brushed fringe. This Macrame Tree can be made any color, if you don't want white. When using 6mm material, the finished size is close to 12 inches wide and 15 inches tall (includes the trunk). To make this tree design smaller, use 4mm cord material. To make a pendant, use 2mm material. Cut 4 cords, each 2 yards long. Cut 26 cords, each 1 yard long. Prepare the cords by applying tape to one end, which makes it easier to add the beads to your Winter Tree. Step 1A: Arrange the four 2-yard cords vertically on your board. The end without the tape should be at the top. Mentally number the cords. 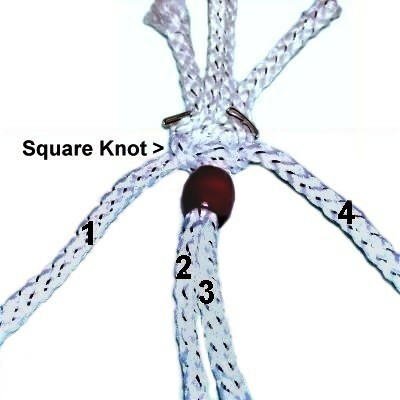 Tie a Square knot using cords 1 and 4. Cords 2 and 3 are the fillers. 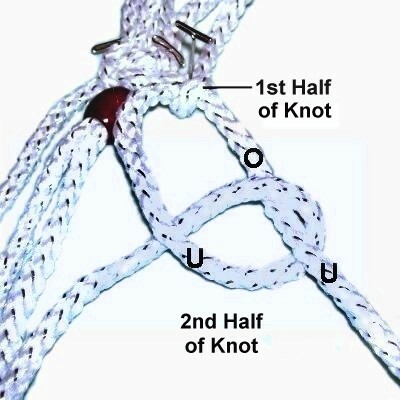 Important: This knot should rest 2 inches below the cut edges. << Move cord 1 to the right, over the fillers (cords 2 - 3), and under cord 4. << Move cord 1, (now on the right), over the fillers and under cord 4, moving right to left. 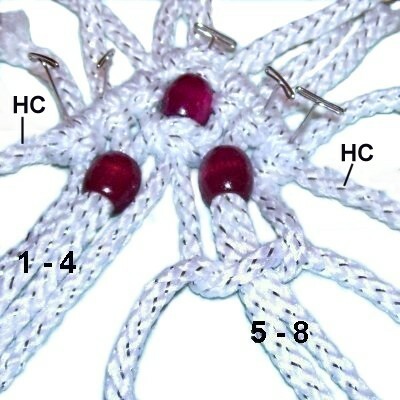 Slide the first bead onto cords 2 and 3. Move cord 1 and 4 to the sides and arrange them on the angle you want for the edges of the Winter Tree. Secure them so they have tension, since they will function as holding cords. 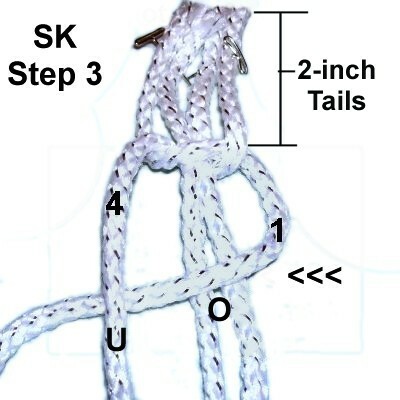 Step 1B: Place a 1-yard cord under holding cord 4, close to the Square Knot. There should be a 2-inch tail to the right of the holding cord. Tie the first half of a vertical Larks Head knot by making a counter-clockwise loop around the holding cord. To do this you pass it over - under the holding cord and over the cord you are using. Important: All the knots in the Winter Tree should be tightened firmly, including this one. 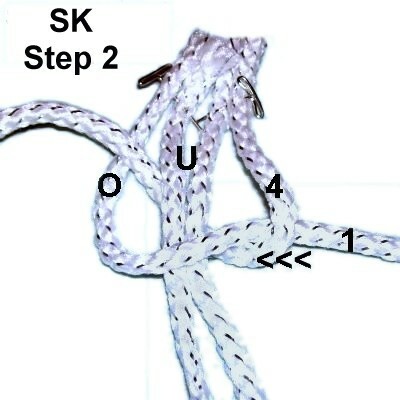 Step 1C: For the second half of the Larks Head knot, make a counter-clockwise loop around the holding cord. Pass it under - over - under as shown. 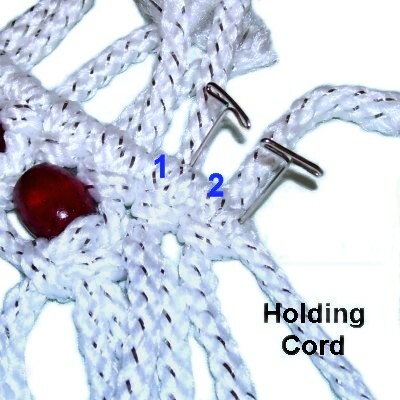 Step 1D: Place a 1-yard cord under holding cord 1. There should be a 2-inch tail to the left of the holding cord. Tie the Larks Head knot in a clockwise direction. This is the same as in step 1B and 1C, except for the direction. Step 2: Since you added cords, you must now mentally re-number the working cords. This does not include the holding cords. They should be labeled right and left. 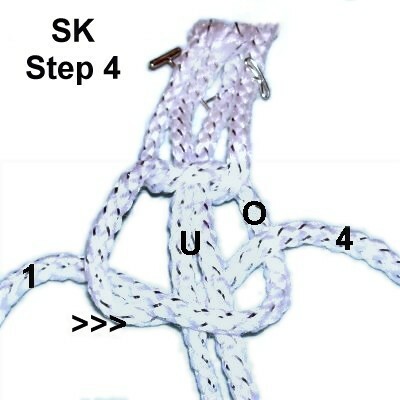 Tie a Square Knot with cords 1 - 4 (as in step 1A). 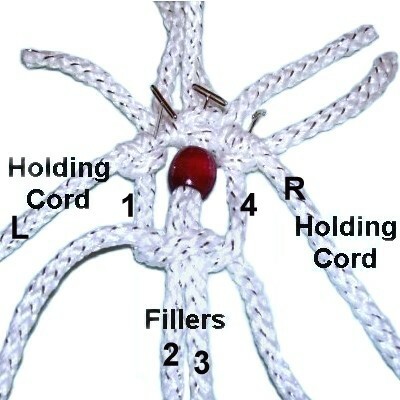 << Add a 1-yard cord to the right holding cord with a Larks Head knot (steps 1B and 1C). Step 3: Mentally re-number the six working cords. 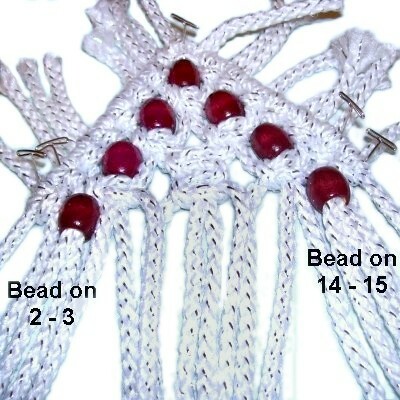 Slide a bead onto cords 1 - 2, and on cords 5 - 6. Add another 1-yard cord to the left holding cord, as you did in the previous steps. 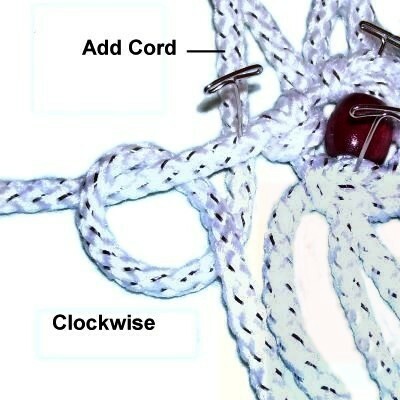 Add the next 1-yard cord to the right holding cord. Divide the working cords into two groups of four. Tie a Square Knot with cords 1 - 4. Do the same with cords 5 - 8. Important: The holding cords were moved for the photo. They should remain straight and secured while making the Winter Tree. 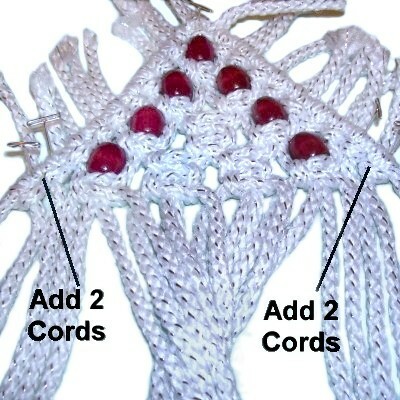 Step 4: Add two 1-yard cords onto each holding cord, as you did in previous steps (total of 4). This will give you a total of 12 working cords. Mentally number them 1 - 12. 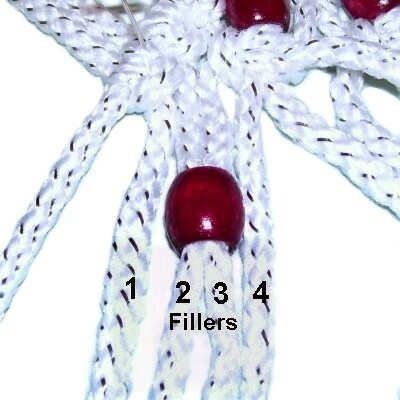 Place a bead on cords 2 and 3, which are fillers for the next knot. Tie a Square Knot with cords 1 - 4. 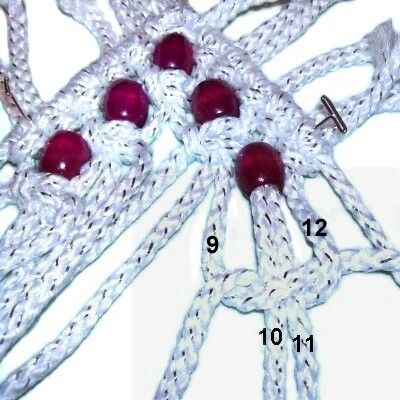 Slide the next bead onto cords 10 and 11. 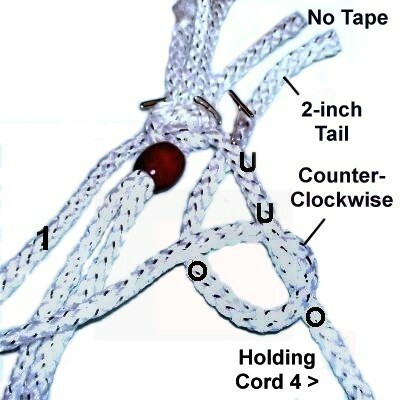 Tie a Square Knot with cords 9 - 12. Step 5: Tie two Square Knots with cords 5 - 8, one below the other. 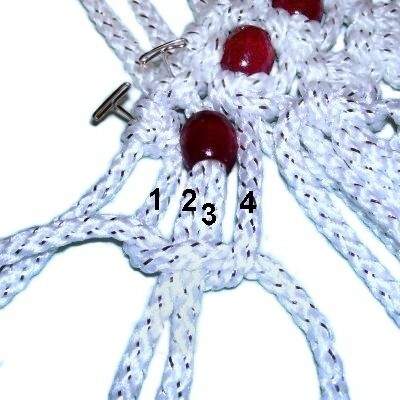 Make sure they are both tightened firmly, so they line up with the other two you just tied in step 4. Step 6: Add two more 1-yard cords to each holding cord (total of 4). Use the same technique as in the earlier steps for the Winter Tree. 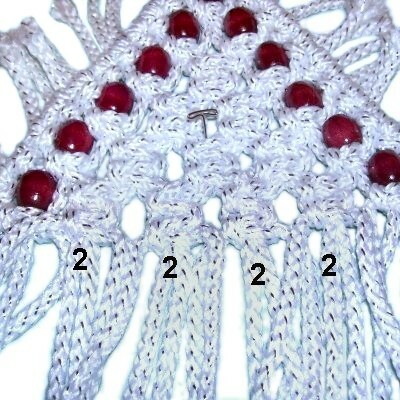 Place the next bead on cords 2 and 3. Add another bead to cords 14 - 15. 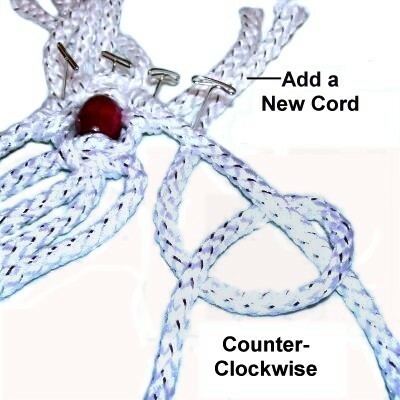 Tie a Square Knot with cords 13 - 16. Step 7: Tie two Square knots with cords 5 - 8. Do the same with cords 9 - 12. Tighten firmly so all the SK line up. Step 8: Add two more 1-yard cords onto the holding cords, as you did in previous steps (total of 4). Mentally re-number the cords 1 - 20. 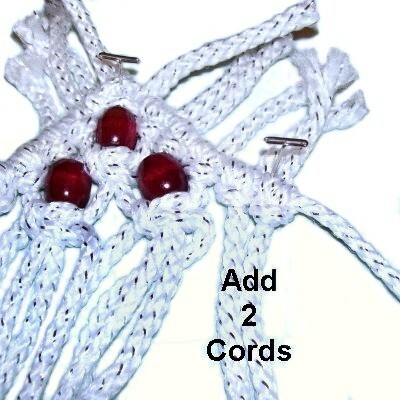 << Add a bead to cords 2 - 3. 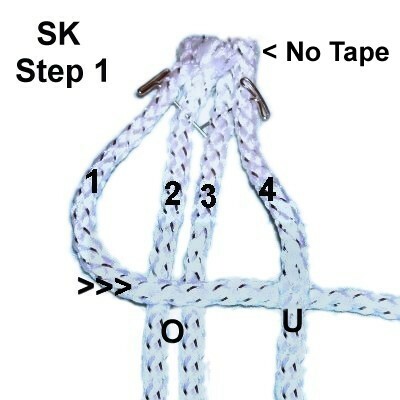 Tie a SK using cords 1 - 4. Add a bead to cords 18 - 19. Cords 5 - 8, 9 - 12, and 13 - 16. 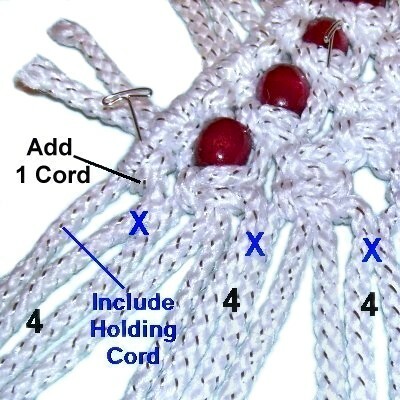 Repeat step 8, adding two 1-yard cords to each holding cord. Mentally number the cords 1- 24. Place a bead on cords 2 - 3. 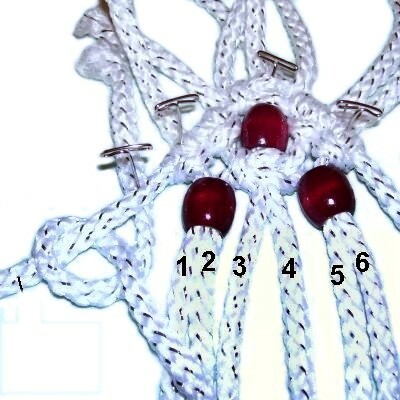 Tie a Square knot below them with cords 1 - 4. Place another bead on cords 22 - 23. Tie the SK with cords 21 - 24. Cords 5 - 8, 9 - 12, 13 - 16, and 17 - 20. 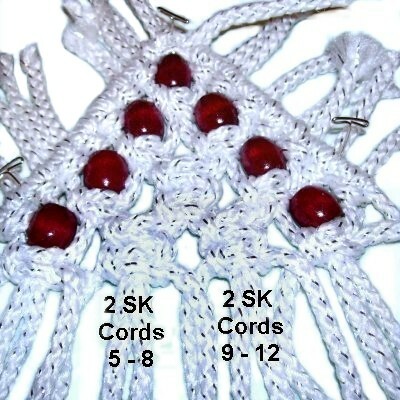 Add one 1-yard cord to each holding cord as you did the others. Mentally re-number all the cords, including the two holding cords, 1 - 28. In the image above, the first three groups are marked with the number 4. The beads are placed on the FILLER cords (marked with an X) for those particular Square Knots in the last row of the Winter Tree. Step 10: The two holding cords used previously are very long compared to the others. Cut a piece of material from one of them, at least 18 inches long. 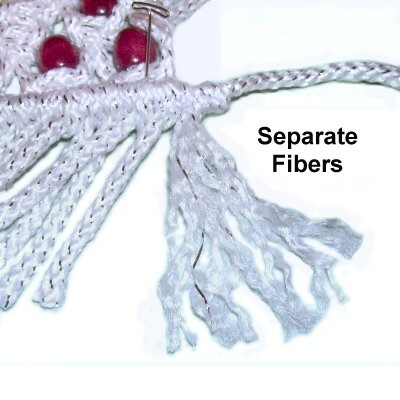 Important: Make sure the holding cord has at least 8 inches left, since you still have one knot to tie for your Winter Tree, and the fringe. Another option is to cut the cord from the roll of material. Step 11: Tie an Overhand knot 2 inches from one end of the new cord. Secure it on the left side of the tree, against the left edge. Tie another Overhand knot at the opposite end, placing it so it will rest against the right edge (when it's pulled taut). Secure the cord horizontally, with tension. To create the bottom of the Winter Tree, you will be tying Double Half Hitches with most of the previous working cords, along with the two holding cords (total of 24 cords). In the instructions, they are called the vertical cords. 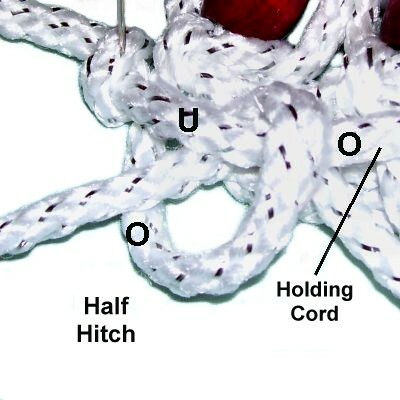 A Half Hitch is tied by making a loop, over - under the holding cord. 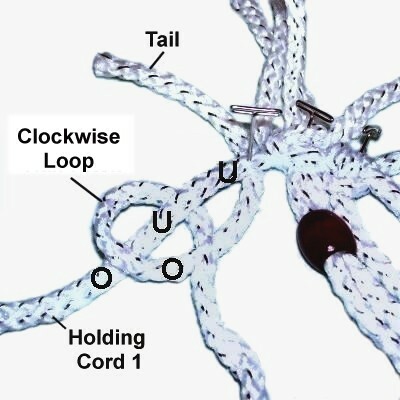 To complete the loop, pass over the portion of the working cord just below. Tie a second knot the same way, to make it a Double Half Hitch. Step 12: Mentally number the vertical cords 1 - 28. 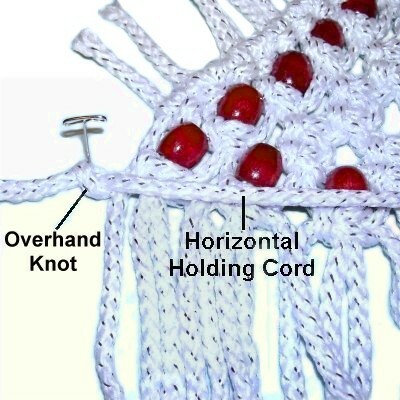 Attach cords 1 - 12 onto the horizontal holding cord, with Double Half Hitches (DHH). Step 13: Separate vertical cords 13 - 16 (for the trunk). Pass cords 14 and 15 in front of the holding cord and leave the other two behind it. Tie a sennit of Square Knots with the four cords, at least 3 inches long. Attach cords 17 - 28 to the holding cord with DHH. Step 14: Start the brushed fringe at the lower edge of the Winter Tree. Trim each cord to 2 inches, and save the scraps. Separate and brush the fibers. When the entire row is finished, trim to neaten the fringe. Step 15: Turn over the tree, so you are working at the back. Apply glue to the back of the trunk, then arrange cords 14 - 15 on top of the glue. 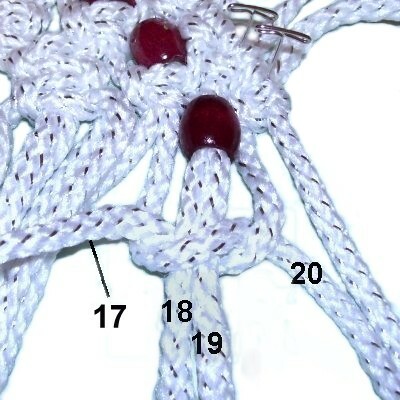 Use cords 13 and 16 to tie an Overhand knot. Add glue as you tighten, so it's on the inside. Use clips to hold the cords until the glue dries. Step 15, continued: When the glue is dry, push the ends of cords 14 and 15 through spaces just above the row of DHH. They will become part of the fringe, and need to be passed to the front of the Winter Tree. 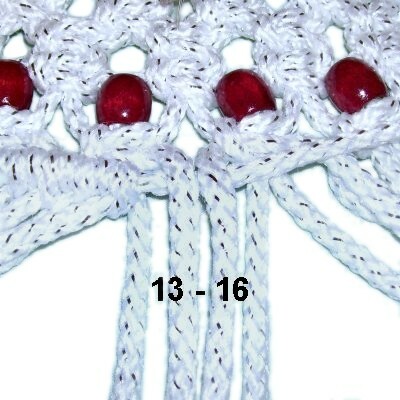 The other two cords (13 and 16) can be cut off. Step 16: Cut 6-inch pieces of material from the scraps and/or what you have left in the roll. Slide one end through a small space above the row of DHH, so the cut edge is in the front. Position the other end through a different space. When all the cords are added, separate and brush the fibers while holding each one steady. 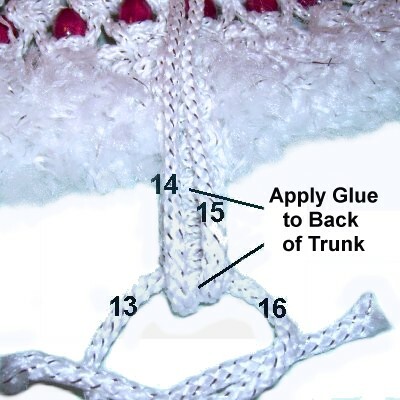 Step 17: Add at least 2 cords to the area above the trunk, so the fringe rests over it. 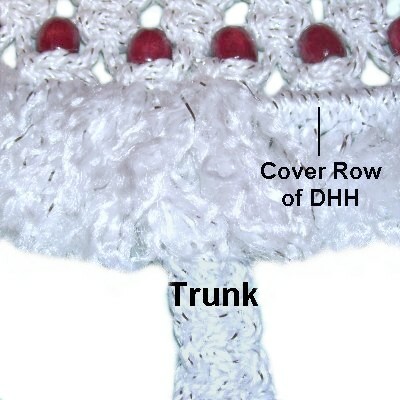 The goal for the lower fringe of the Winter Tree is to cover the entire row of DHH. So add as many cords as needed. Step 18: Repeat step 14, creating the fringe along the sides of the tree. 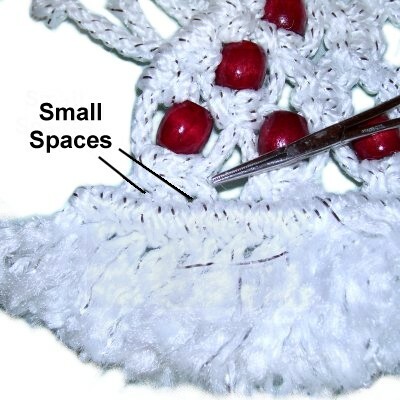 Trim each cord to 1.5 inches, and then separate and brush the fibers. Do the same with the cords at the top. Repeat step 16, adding 6-inch pieces of material. Make sure at least one end of these cords is passed through a SMALL space. The other end can be pulled through a larger space if necessary. 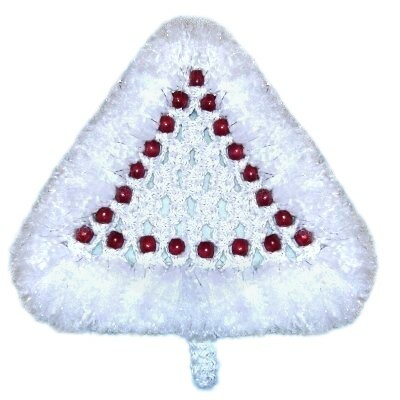 Trim and neaten the entire brushed fringe all the way around the Winter Tree. Add a piece of scrap cord to the back, and use it to hang your new holiday decoration on a wall. Have any comments about the Winter Tree? Contact Me.